This certified organic winery for sale is situated in a wonderful panoramic location in the hills along the Tuscan coast south of Pisa in Italy. This winemaking property also includes an organic olive oil production as well as a holiday rental business (Agriturismo). A typical and fully restored country house (about 300 m²) out of the 19th century, made of natural stone, is the centrepiece of the estate. The country house offers four independent apartments in different sizes, of which three are rented to international holiday guests, many of them return regularly. All apartments feature traditional and sought-after building elements of Tuscan country houses. A beautiful saltwater swimming pool was created close to the country house, offering magnificent panoramic views. The country house and swimming pool are surrounded by about 2 hectares of land. The property includes 23.5 hectares, of which 8.5 hectares are vineyards. About 7 hectares are olive groves with about 1,100 olive trees, which are on average 30 years old and in full production. The annual olive oil production currently reaches about 2,000 – 3,000 litres of excellent cold-pressed organic olive oil. About 6 hectares of fertile land can partially be planted with additional vineyards. The soil is rich of mineral nutrients and, in conjunction with a good microclimate, allow the local grape varieties Sangiovese, Merlot and Cabernet Sauvignon to thrive in organic quality. The winery currently focuses on three red wines, which have received several awards, a rosé and a white wine, with a total volume of about 50,000 bottles per year. The property includes a cellar building (about 150 m²), housing stainless steel tanks and equipment for a modern wine production, a restored barn for machinery, an ageing cellar as well as a detached and fully restored tasting- and salesroom in the centre of town. The wine cellar is run with a new photovoltaic system. The estate's location in the hills close to the sea is unparalleled. The Tuscan coast and its beaches can be easily reached. The airport in Pisa is about 50 minutes away. Italy, region Tuscany, province Pisa. 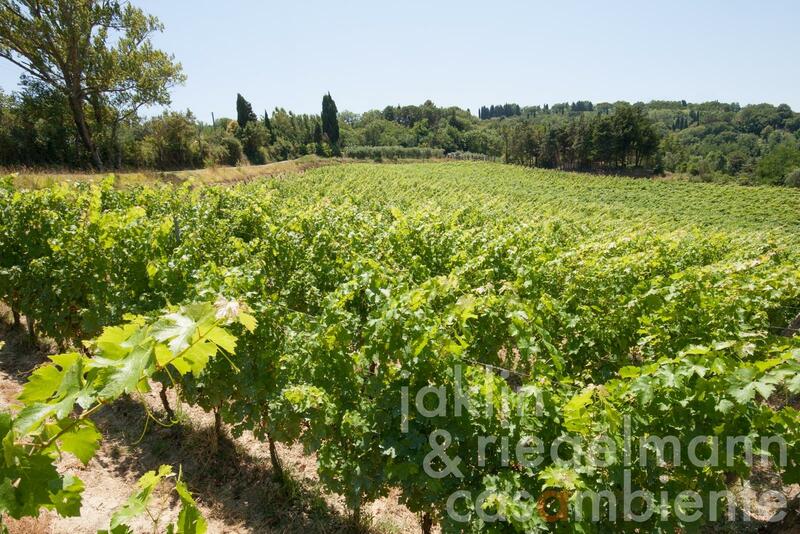 23.50 ha with about 8.5 hectares of vineyards and 7 hectares of olive groves. Electricity, photovoltaic modules, mains water, own well water, central heating, fireplace, gas tank, broadband internet access, satellite-TV, swimming pool, garage, private parking, carport, terrace, vineyard, olive grove, garden, furnished.